← How could a $200 tip make things worse? What is your honest answer? I’d like to get in contact with you Stacy and I have send you an e-mail to “orders@stagecoachwest.com”. I’d be very grateful for an response! Perfect, I have sent you an new e-mail! That is so true. In times of grief he has held my heart, in times if dispare he has calmed my mind, in moments of anger he has gave me grace and everyday I wake up and take a breath he holds my hand. What a blessing and riches he has bestowed on me. 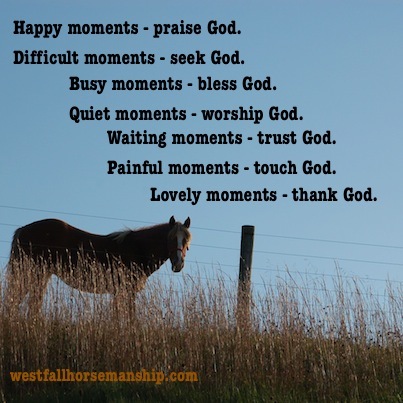 I thank God today for a special day with my horse. I am trying to overcome some fear issues with him and we are achieving steps towards that goal!! !